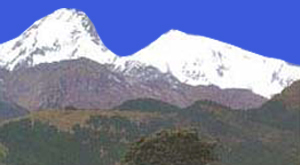 Just west of Langtang National Park is a group of peaks called the Ganesh Himal. This trek takes you through river valleys and traditional farming communities that contain a variety of the ethnic groups in Nepal. The trek also goes through pine and rhododendron forests and across various passes and cols. There are wonderful views of Langtang, Gosai Kund, Ganesh Himal, Boudha Peak, Himal Chuli, Machhapuchre, South Annapurna and Annapurna II. Due to the easy accesability of this trek there are opportunities for treks lasting under a week. Length of trek Dhunche – Dhading 12 days Dhunche – Gorkha 16 days Tirsuli – Gorkha 3-7 days Average hiking per day 5 hrs Maximum elevation reached 4000 m. 20 days in Ganesh Himal: This takes goes through pine and rhododendron forests, across various passes and cols and finishes at Gorkha . There are good views of Langtang, Gosai Kund, Ganesh Himal, Boudha Peak, Himal Chuli, Machhapuchre, South Annapurna and Annapurna II. Despite the numerous peaks in view this area offers you to walk through the villages specially some of the well knows ethnic groups of Nepal i.e. Tamag and Magar including Chhetries, bramin etc. River Valleys and active farmers are some of the interesting part of the adventure. It takes about 4hours drive from Kathmandu. to Trisuli bazaar . in afternoon visit a Nuwakot palace which was built by Prithivi Narayan Shah who reunified Nepal by 1786. Soon after leaving the Trisuli bazaar cross the suspension bridge of samari khola . trek along the river through rice paddies, passing the small villages along the way you will reach to Deurali village. Which occupied by mixture tribes.along the route one can have a good view of Trisuli valley . Move on from the Deurali towards to Salme village.trail continue uphill through forest to reach Bhaisi Kharka. The camp site is very beautiful ground. 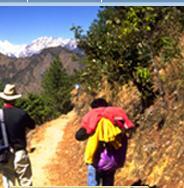 Trail continues gradually uphill through bamboo, pine and rhododendron forest to reach to Kharani odar. Many different kinds of birds and wildlife can be seen. Since the journey is long and gain about 1200m of elevation. It is wise to leave early in the morning . the path will enter a thickly forested area with many fir trees and rhododendron and ascends will become more serious. Passing many Kharkas and small peaks you will get on the ridgeline from where you will see very good views of Langtang himal and ganesh himal at very close distance. Trail continues down hill through pine and Rhododendron forest. It is an easy descending and very quite along the way. After descending few hours you will reach to Sherthung village which is one of the biggest Tamang village in this area. From sherthung it will take about 2 hours to reach Chalise. Walking through rice paddies and terrace you will reach to Tir Khola. After crossing suspension bride trail continues uphill till Laba. It is an one of the biggest and interesting village to visit. Trail goes uphill through bamboo and Rhododendron forest. When you reach top of Mangaythati you can have a good views of Ganesh himal and Manasulu range. Trail descends though forest and small village to reach Ghunchet. Along the way you can have a good view of Burigandaki . Today the journey continues in the bank of Burigandaki and passing through rice paddies. Day 14 Arughat bazaar to Khanchowk Village. Today you have to climb uphill all the way to Khanchowk village. Today is a very pleasant walk . passing through many small villages along the way and enjoy a good view of valley and mountain. Day 16 Gorkha to Kathmandu. The bus journey will take about 5 hours to reach Kathmandu. Day 17 Free day in Kathmandu.